Are You Simply Just Going Through The Motions? We all know that scene in the movie Jingle All the Way where Arnold Schwarzenegger is on the phone to his customers on Christmas Eve? Have you ever been in a situation where you’ve been the recipient of an automated, robotic response that hasn’t taken into account your personal situation at all? Well, if it is that important to you or your organisation, then why am I being spoken to by a machine, instead of an individual real live person? The trouble with a lot of automation, and I include “automatic” responses in this as well, is that often the response does not even sound how people actually talk to each other. And that’s a dead giveaway. Like on LinkedIn, when you are prompted to congratulate people who you are linked to on their birthday’s and anniversaries. I know it’s a little bit of a chore, but at least the creation of some visible and noticeable variety in your responses can start to set you above the world of automation. What about when you ask someone how they are? Who ever uses a one word sentence “Yourself?”?? And what on earth does “Not too bad” mean exactly? It means you’re far too lazy. And it means you don’t mind using robotic double negatives in your icebreakers. Well, give me a break. Stop going through the motions. Stop being disingenuous and start being more genuine with your responses. The people that you associate with will notice the improvement. What do you have to stop doing? As a business owner, you need to be at the top of your game. People look up to you for inspiration, both on a personal level, as well as on an institutional level. They want to see you as a successful figurehead running a successful enterprise. The two go hand in hand. The result of being a successful leader should be that you can create success in your organisation. And conversely, successful businesses rarely rise up as a result of poor leadership. With that in mind, what are the things you need to give up? Do you need to stop smoking? Do you need to stop making excuses for your poor exercise habits? Do you need to give up alcohol? Do you need to give up eating processed foods? Do you need to give up on foods high in fat and in sugar? Do you need to give up coffee? What behaviours do you need to give up? What people do you need to stop seeing? Do you have friends, and I use that term loosely, who are constantly bringing you down? You know the types…. they are HARD WORK, and after every time you see them, you feel as if you need a good dose of Tony Robbins to bring you back to where you ought to be? These people act like this because of their own feelings of inadequacy. And whether their behaviour is calculated, or whether it is just intuitive to them, it is a behaviour that they need to eliminate. Because it serves no purpose. And it is a behaviour they can change. Until they do, you need to give them a rest from your social scene. And do you have patients who behave in this way too? Well, why not suggest to those patients that they need a new dentist? Life is too short to be tolerating these kinds of people. Do you know people who wallow in their own misery, yet despite constant and repeated suggestion from well-meaning friends, these people never take the necessary actions to improve their situations? Again, an afternoon with these people is like a week of watching Kiss of a Spiderwoman…. There comes a time to end these associations, and that time is now. These new people need to recognise that the “House Full” sign is up at present. If you are guilty of this behaviour, either as the approacher, or as the recipient, you need to stop it. Do you experience certain emotions that distract you from your purpose? You need to take control of those emotions, and eliminate them from your behaviours. Terror and fear. Get rid of them. These two emotions can stop a good person in their tracks. You need to recognise them when they occur, and you need to then rationalise your situation, and progress through that moment. Sunshine always follows after rain. Move on to a sunny place. Also, avoid greed and avarice. Have goals, yes. But do not covet the assets of others. Are you engaged in time wasting behaviours? Do you constantly and repeatedly “check your device” even when you don’t receive an alert? Are you continuously reading your emails at all times of the day? Are you guilty of repeatedly surfing through social media aimlessly? Allocate specific times of the day to do these things and be rigid with your applications. Because then you can then allocate time to be doing the productive things you need to be doing. Limit your times to be taking and receiving phone calls. Turn off your phone while working. You can always return calls later. And when you do return calls, set a time frame. Don’t allow the telephone to become an offensive time sucker. We all, each and every one of us, have twenty-four hours allocated to us each and every day. And when the day is over those twenty-four hours are gone. It is how you use those hours that determines your success. As Brad said, make a list, and take action. Your first day of your better life is here, just waiting for you to give up and STOP those debilitating thoughts, behaviours, habits, and people. Really, Every Day Should Be Just Like Christmas. Christmas Day arrives on the same day each year. But, we know that Christmas Day is always on December 25 each year. The earth does not speed up during December to bring Christmas to us more quickly. Christmas is when Christmas is. Are you sick and tired of hearing this one? Why is it that Christmas is used as a reason for the socially slack to start offering their friends a form of social ultimatum? Really, if you’d been a good friend already to all of those people in your life that truly matter, then you wouldn’t be using Christmas as some form of deadline for catching up with those acquaintances that you’ve failed to keep in touch with. It’s such an over-used cliché that it has indeed lost its literal meaning. Nobody who ever says this really means it…in fact, I’ll bet they live in fear of everybody they say this to actually “calling in the rent” on it. This is another time-wearied cliché. Why just say this in December? every time that you farewell them. Wouldn’t that knock their socks off? I think I get it, David…..
Why aren’t people nice to each other all year long? Why don’t people get together at any time, and not just at Christmas time? Our world would be a far better place if everybody treated everyone else as if each day was just before Christmas. I get what Christmas is. But I just don’t get why we can’t treat people nicely all the time? As if every day was just like Christmas. Why can’t people be nice to each other every day? Offer great service every day. Say something complimentary to everyone every day. Offer someone an unexpected helping hand every day. “Toxic” Is The New Black…..
“Toxic” is The Oxford Dictionary Word of the Year for 2018. And well may you ask, what exactly is the Word of the Year? Well, each year the Oxford Dictionary awards the title “Word of the Year” to a word or expression that is judged to reflect the ethos, mood, or preoccupations of that previous year. The word also has a lasting potential to carry on as a term of cultural significance. And in 2018, the word “toxic” was their standout choice for Word of the Year. Now, the Word of the Year is not a title or term exclusive to Oxford Dictionaries. There are other dictionaries who also award their own “Word of the Year” gongs. The adjective “toxic” is defined as ‘poisonous’ and first appeared in the English language in the mid-seventeenth century. According to the people at Oxford Dictionaries, in 2018, the word “toxic” became “an intoxicating descriptor” for the many of the year’s most talked about topics and subjects. They said it was the “sheer scope of its application” that made “toxic” their stand-out choice for Word of the Year. In fact, their data showed that, along with a forty five percent increase in the number of times it was looked up online on www.oxforddictionaries.com, over the previous year the word toxic has certainly been used, and maybe over-used, in a multitude of contexts, both literally and metaphorically speaking. Although most of these applications are understandable in the literal sense, the rise in popularity and the misuse or abuse or over-use of the term “toxic masculinity” does leave a lot to be desired. Would the world ever consider the term “toxic femininity” to be an actual term? Maybe the creation and use and over-use of the term “toxic masculinity” is in itself a form of “toxic abuse” and unnecessary “toxic harassment” and application, or over-application? In terms of appropriateness, the pairing of “toxic” with “environment” and with the word “relationship” now are commonplace in describing terminal situations that people now find themselves in. The term “toxic environment” has been more frequently used in 2018 in reference to harmful workplace environments and the toll they are taking on the mental health of those caught up in these workplace situations. From overly demanding workloads to outright bullying and abuse and harassment both of employees and of customers, many companies have been exposed in 2018 for their “toxic culture”. Even the Speaker of the House of Commons was accused of misusing his official powers to cover up allegations of bullying in Westminster. Heaven help us if this sort of culture were to be conveyed by organisations who we trust and love, like our banks and our health insurers. The people at Oxford Dictionaries also point out that “toxic relationships” are not exclusive to the workplace. Apparently, the word ‘relationship’ was the sixth most-seen “toxic” topic in 2018. And apart from the traditional “partner” relationships, I’d even go so far as to suggest that the word “toxic” is now becoming over-used in describing any “associations”, including many so-called “friendships”. To me, if an association is starting to feel “toxic”, it’s time to end that association and move on. Life is too short to be bothering yourself with “toxic”. End them and move right along. There’s a better world waiting for you just around the corner. Make it your goal to make “toxic” your UN-WORD for 2019. Creating World Class Dental Hygiene Service In Your Dental Practice. Part VI. Today I’m going to discuss the best way that I found to complete the regular patient’s hygiene appointment so that the patient schedules and keeps their next appointment, AND is also eager to bring that appointment forward should a vacancy arise. This article is Part VI and is the final part, or piece, of a weekly series of articles that explains IN DETAIL the hygiene process that I used to transform the hygiene visit for the regular loyal dental patient away from being considered to be “it’s only a clean”, and to be AN ULTIMATE PATIENT EXPERIENCE each and every time. Five weeks ago I began by reviewing the important role that a dental hygienist plays in the creation of an EXPERIENCE for their patient so that the hygiene visit for your regular loyal dental patient is not simply “just a cleaning”, including the important role of the hygienist in creating a perfect platform at the start of the patient’s hygiene appointment, truly “setting the stage” for the remainder of the visit to be a World Class Experience. Then four weeks ago I wrote about the level of trust that gets established between the hygienist and the patient during the first forty minutes of the hygiene appointment, and how with that, the subsequent time taken by the dentist to do the examination and explain treatment inside the hygiene room is significantly reduced compared to when the hygienist takes no part in any uncovering and discovery of areas of concern prior to the arrival of the dentist. 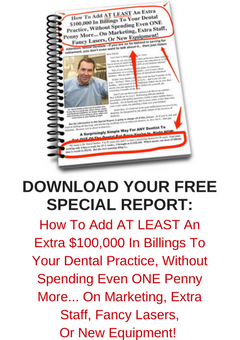 Three weeks ago I reviewed the best way for the dentist to be alerted about the hygiene exam, and how to turn that notification into a systematic, structured and discrete internal advertisement for your dental practice and your world class customer service systems. Two weeks ago I wrote in detail about what exactly we did at the examination process for the dental hygiene patient who visited our dental office for their regular hygiene appointment, and how we transformed that process into an ULTIMATE PATIENT EXPERIENCE each and every time. Last week I wrote about the handover process between the dentist and the hygienist that occurs in the hygiene room following the dentist’s examination for the loyal regular dental hygiene patient. Today we’re going to cover BUILDING BLOCK #5 of The Ultimate Patient Experience for the dental hygiene patient: The Ultimate Post-Appointment stage of the hygiene patient’s visit. Following on from the Handover from the Dentist to the Hygienist. After the dentist has completed the handover of the patient back to the dental hygienist, he then departs from the treatment room. The patient is now left in the care of the hygienist, whose role it is now is to make sure that the patient’s “CLEAR. NEXT. STEP.” remains front of mind for them. It is important firstly, that the hygienist clarifies with the patient exactly what they are going to have done at their next visit, and the scheduling of that next visit is what they are going to now do. to reinforce the dentist’s handover point about what will happen if we do not do the treatment NEEDED in the time frame recommended. The hygienist then assists the patient with their appearance so that they can present their “best face” to the outside world, and also helps the patient gather up any bags, or goods, or coats or umbrellas they may have brought in with them. Just as in the pre-appointment stage of this visit, there is a protocol for walking with the patient from the treatment room back to the front office area. This protocol is designed to keep the patient’s next dental visit required in that FRONT OF MIND location, so that when the patient then sits down with Jayne out the front this next visit is the first thing that is organised, before any social discussions are raised. The handover of the hygiene patient to the front office person by the hygienist will follow the same ten steps that all Ultimate Handovers follow. The hygienist brings the patient into the appointment scheduler’s office and motions for Betty to sit across the desk from Jayne. The hygienist, Emily, then stands on the same side of the desk that Betty is sitting, and then begins to speak to Jayne. This purposeful positioning allows Jayne to alternate her attentive look [as it is needed] between the eyes of Emily and the eyes of Betty. Emily is NOT positioned on the same side of the desk as Jayne, as this creates an intimidating two-on-one positioning that must be avoided. Emily will include Betty in the conversation with Jayne. During this whole conversation, Jayne is looking across to Betty at the appropriate times to receive a nod of acknowledgement from Betty about each point that Emily is saying. Jayne is looking for understanding from Betty that she knows what treatment she is going to be having next, and when it needs to be done, and what will happen if it is not done in the time frame recommended. Emily is also relating to Jayne that Betty wants to be called and have her appointment brought forward if there is a change in Dr Moffet’s schedule. Once this restorative information has been conveyed to Jayne, Emily then farewells Betty by thanking her for coming in today, and thanking her for being such a great patient, and wishing her well. Emily also mentions some future moment [of Secret Service] coming up for Betty, and if she has opportunity, Emily creates an Above and Beyond experience for Betty as well. When Emily then leaves Jayne’s office, Jayne then goes ahead and schedules the next appointment with Betty. After the scheduling, Jayne then processes Betty’s payment for today’s visit and then Jayne and Betty relax and visit about what’s going on in Betty’s life at the moment. This “social visit” with Betty at the end of her visit can be as long as it needs to be. Finally, Betty is farewelled by Jayne with the same five social steps of the Ultimate Handover [that are all about Betty]. She knows exactly when she will be returning, and she knows what treatment she will be having. More importantly, she’s looking forward to seeing Jayne and Emily again, and she’s hoping to receive a call from Jayne to bring that next visit forward. Betty truly has been the recipient of World Class Service and attention during her regular hygiene visit. It has indeed been an Ultimate Patient Experience.